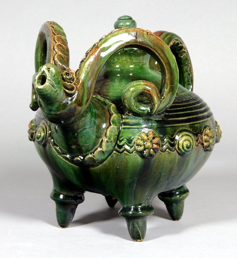 Rams are said to be symbols of leadership, strength, dignity, and perseverance.....and stubbornness. 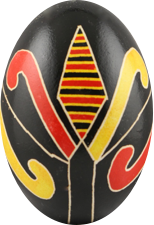 They are a popular motif in Ukrainian art. 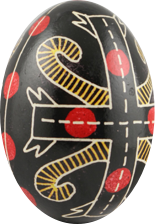 Small ceramic rams are quite commonly found in Ukrainian markets and folk art museums. 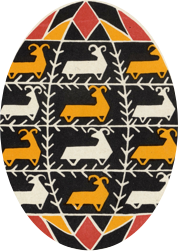 Jacques Hnizdovsky, renowned Ukrainian artist, returned often to the theme of rams in his work. 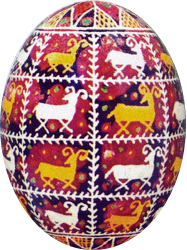 Rams are sometimes portrayed whole on pysanky. 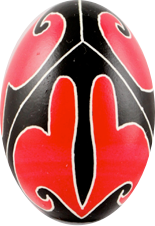 They are characterized by their curved horns. 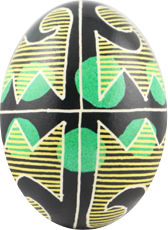 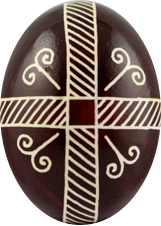 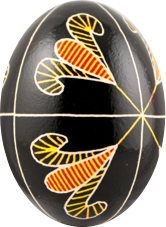 Below are tow fairly similar Hutsul pysanky from Elyjiw and Binyashevsky with baran motifs. 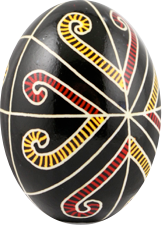 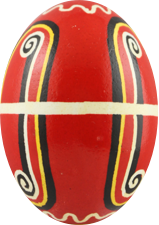 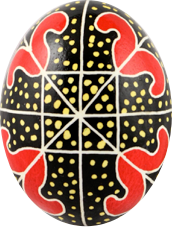 And these examples of pysanky from Podillia are given various names--besahy (saddlebags), kryla (wings), holubka (dove), kosi rukavy (oblique sleeves), pavy (peacocks), bezkonnechnyk (endless line). 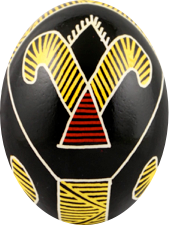 Some sources identify the motif above as a ram; many others as the hand of god. 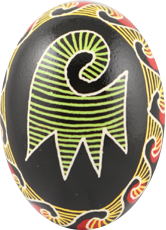 The most common representation of rams on pysanky is via their horns alone--curved spiral elements, with a mirror image of two diametrically opposed horns. 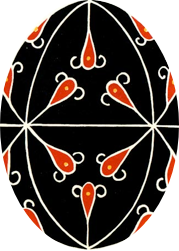 According to M. Korduba (1896), in Subcarpathia paired spirals give the sign of the ram. 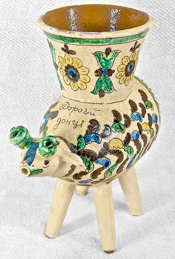 Selivachov notes that rams horns sometimes are inclined together and have forms of symmetry other than mirror image, or are totally devoid of symmetry. 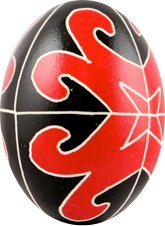 Podillia has the largest number of iconographic variants--apart form the mirror image spiral, here we can find three- and four-armed, and even eight-armed figures with S-shaped elements resembling swastikas. 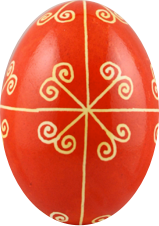 Here are a few more examples of such small “rizhky,” from the Cherkasy (red) and Chernihiv (brown) regions. 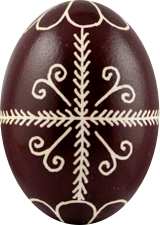 Horn motifs are an ancient symbol, and found throughout Ukraine. 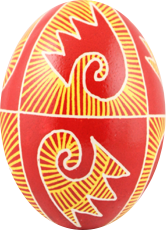 The large red horns that look like a flower come from the Kyiv region; the rest of the pysanky are from the regions of Cherkasy, Poltava,Cherkasy and Kirovohrad. 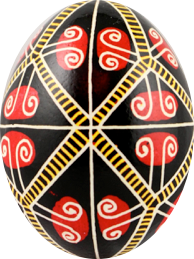 Per Selivachov, archeologists think that in the Trypillian culture, the spiral element now called “ram’s horns” was a sign of male fertility, alongside the diamond, which was a female sign. 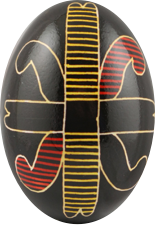 Framed by a pair of bull’s horns, the diamond signifies the marriage of the female deity with the sun in the form of a bull. You can see the juxtaposition of these two symbols in the fourth pysanka above; it is form Cherkashchyna, the heart of later Trypillian settlements. 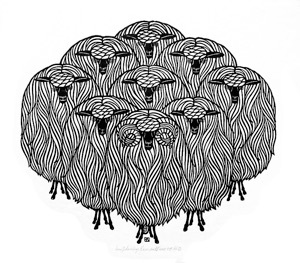 These Trypillian beliefs may have carried over in the symbol, as the ram (sheep) remained a symbol of male fertility. 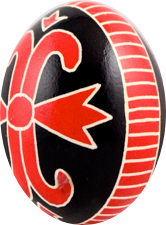 Animal motifs are sometimes thought to bestow the best characteristics of the animal onto the bearer. 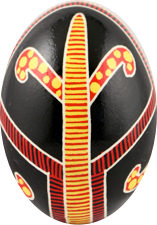 In the case of the ram, these would be leadership, perseverance and strength.